Mom's Gone Bronson! 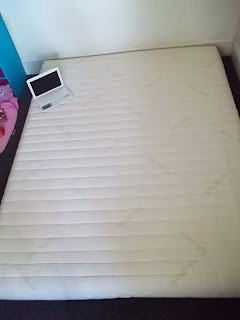 : A MUST in Sleep Comfort; The Tuft & Needle Bed, Review! A MUST in Sleep Comfort; The Tuft & Needle Bed, Review! Then there is my husband, who hates beds all together and just wants to sleep on the floor! I fall somewhere in between the two and, while I would like comfort when I crawl into bed at night, I honestly do like to sleep as close to the floor as I can get [without being directly on it] and so I have to say I am a fan of a good Japanese style bed or futon - and that is where the genius of the new Tuft & Needle bed, which arrived on my doorstep this week, comes into action! The Tuft & Needle bed is just perfect for someone like me! Hand crafted to order, this bed is designed to look stylish on a base or straight on the floor! It looks fabulous in a room all by itself before you ever even go near it with a sheet or a comforter and it just seems to make perfect sense! From start to finish, the bed took a week to be made and shipped to my home. Each second I had to wait was so exciting it was like waiting for Christmas and, when the box arrived on my doorstep, it was actually about the size of a small Christmas tree, too, as the bed is vacuum packed for easier shipping - wonderful! I actually had to then wait a day extra before being able to unbox the bed because my husband works a night shift and, by the time he was up and had left for work, I was tired and ready for bed myself! So! The following morning, I launched myself out of my old bed at 4am, with excitement, and moved the old base and mattress outside! My old queen bed had done us a great turn but it was big and bulky and just seemed to loom over in the corner of the room and needed to go! When I had finished clearing the space for the new Tuft & Needle bed, I opened the box and had my son help me to pull the bed out! It was rolled up and packed so tightly that I really didn't know what to expect; I knew that it would take a little while for the air to get back into the bed [and to restore it to its original size] though and so, I waited! After just a few MINUTES the bed was already on its way to resembling the photos online and it looked so inviting it was hard to wait to let it expand! A couple of HOURS later, the bed was plump and complete and so, of course, the first thing I did was to lie down on it and see if it felt as good as it looked, which it absolutely did!! The bed felt soft and cushioned with a firmness from being close to the floor, which is great for my back and comfort! It looked and felt so good that I didn't want to spoil it with sheets or comforters until I had to and I didn't even want to get back up again once I was on it! I have now slept on the bed for a couple of nights and I do feel very comfortable in any position and my back is thanking me for the switch out of our old one! I love the simplicity of the bed and the versatility of it at the same time - I wouldn't have any problem moving it to another room as it is quite light, and I wouldn't have any problems moving it out of the house all together if we were to pack up and move! This bed is, for sure, a keeper! In fact, there are just so many good things to say about the Tuft & Needle bed that I could sit here all day and gush about it, but when you buy a Tuft & Needle bed you are doing SO much more! Not only is the bed hand-crafted and made in America, it is made from sustainable materials and recyclable, too! So you are ultimately keeping a little work in America and doing a turn for the environment at the same time - even the flame resistant barrier on this bed is non-chemical! The bed is available in several sizes from Twin ($199) to King ($499) with Twin XL, Full and Queen in between! There are no middle men and so the price you pay is a fair one and you only have to deal with Tuft & Needle, you don't have to chase around to get what you want or need! There is also a 30 day money back guarantee and a 5 year warranty! Last, and by no means least. Tuft & Needle are also working with non-profit agencies to put children without beds into new ones, which has begun in Phoenix, AZ. To find out more about their cause, you can head on over HERE. I personally think that all children should have a safe, comfortable place to sleep and so I think this is a wonderful thing and hope to see it grow! If you would like to learn more about the Tuft & Needle bed, its specifications, background and other resources then head on over to the website or visit their Twitter and Facebook pages to get interactive, now! I hope you will take the time to check the bed out further, and would love to hear what you think about the bed in general! Disclaimer: I was provided with a Tuft & Needle bed in order to complete this review, which is open, honest and my own opinion. Your views may vary. Discounts and offers may be subject to change at any time and Mom's Gone Bronson is not responsible for any discounts or offer fulfillment. Thank you! I'm so used to a bed being so far off the ground that I've never thought of a bed like this. My husband is always complaining about his back so I can see where this would be beneficial, but how difficult is it to get out of in the morning? Thanks for posting. I'm waiting for mine in the mail after spending a week sleeping on the floor by my sealy pillowtop that had me waking up in knots. I can't wait to get all that bulk out of my house and have this minimalist mattress arrive.